The Quinnipiac women’s volleyball team fell to 5-23 (3-12 in the MAAC) with a loss to conference foe Iona (13-13, 11-5 MAAC) by the final score of 3-0. 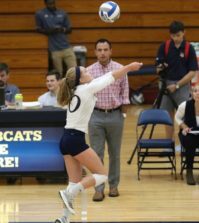 Despite nine kills from freshman outside hitter Katie Urycki, the Bobcats fell in straight sets by the scores of 25-13, 25-15, 25-17. Gael middle blockers Shannon Ward and Catrina Warren were too much for the Bobcats, collecting 25 kills between the two. The Bobcats drew a -.026 hitting percentage in the first set, recording seven errors and only six kills. Warren led the Gaels with six kills to only one error, junior outside hitter Taylor Cembalisty also contributed for Iona with four kills and five digs. Quinnipiac’s Chandler Thornton led the Bobcats in the set with two kills and seven digs. The Bobcats dug themselves into a deep hole in the second set, starting off down 7-2. The Bobcats, led by Urycki and freshman Allison Leigh, fought back to narrow the lead down to three on numerous occasions. The Gaels, led by Ward’s three kills pulled away at the end of the set to win 25-15. The third set started off great for the Bobcats taking an early 3-0 lead, with two aces by Thornton and a kill by senior middle hitter Bonnie Conklin. The Gaels quickly took control of the set, pulling away and winning the set 25-17. Making errors was the problem for the Bobcats today, as they made 20 in the three sets. 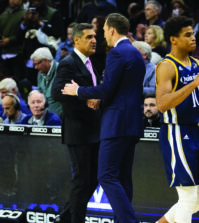 The Bobcats play their final home game Sunday at Burt Kahn against conference foe Manhattan before going to Canisius and Niagara to finish off the regular season.